Reporting on projects involving footwear organisations in the region. Feng Tsai Rubber Outsole Co Ltd has announced its intention to apply for SATRA Laboratory Accreditation. The company was established in 1995 in Bing Duong Province Vietnam. It is part of a Taiwanese-owned company established in 1981 that specialises in rubber outsole for sports, casual and safety shoes. Feng Tsai Rubber Outsole has 550 employees and the average monthly production capacity is one million pairs. The company has recently invested in new machinery for its factory, including equipment for the production of ethylene vinyl acetate (EVA) midsole and a direct injection system. The items produced are supplied to international footwear brand owners. The company says its aim is to improve quality and productivity and develop the performance properties of rubber outsoles. China-based shoemaking company Serena Shoe began trading in Taiwan in 1979 and began its expansion into the Chinese city of ShenZhen 13 years later. In 2007, production was moved to HuiZhou, with one production line kept in Taiwan for future possibilities. The company has also been ISO certified for over a decade and its internal laboratory for physical and chemical testing recently received SATRA accreditation. Serena Shoe owns and operates factories specialising in dye cutting, insole production, outsole assembly, lasts, and lamination. In addition, the company’s sample room reportedly has over 400 employees and technicians handling jobs ranging from conceptual prototypes to large sample lots for sales teams. Production in 2017 is said to have exceeded 6 million pairs, made on three ‘Serena’ lines, six ‘Sabrina’ lines and three ‘Lido’ lines. 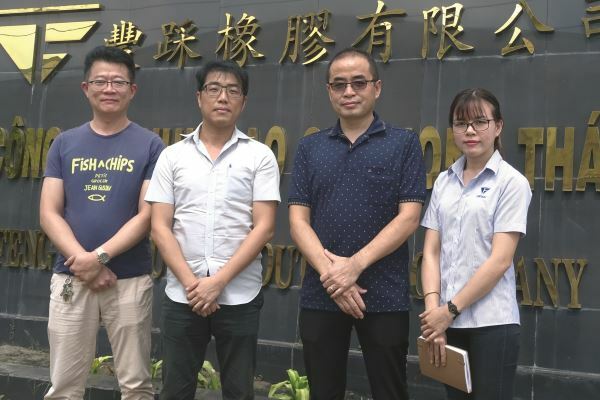 SATRA’s facility in Dongguan has had its best year to date, seeing increases in its three main areas of activity – laboratory accreditation, installation of production efficiency systems and testing services. The number of Chinese manufacturing companies looking to implement the SATRA Laboratory Accreditation Programme to improve their quality assurance and demonstrate this to potential customers increased during 2018 and SATRA has also increased its staffing in this area to cope with the extra demand (see page 19 for details of SATRA’s China office expansion). Considerable interest was evident throughout the year in the SATRASumm upper cutting system which was introduced into a number of Chinese companies during the last 12 months. Both the volume and variety of testing grew during 2018, with the changes to the European Union Personal Protective Equipment Regulation prompting an increase in safety footwear testing and certification for the European market. The photograph above shows members of the Feng Tsai Rubber Outsole team – from left to right: SK Chen, Ken Chen, Guo-Dong Zhang and Sarah Li. Please email info@satrafe.com for further information on SATRA’s activities in Asia. This article was originally published on page 42 of the April 2019 issue of SATRA Bulletin.